I don’t even know what to call this piece of furniture. Spice cabinet? 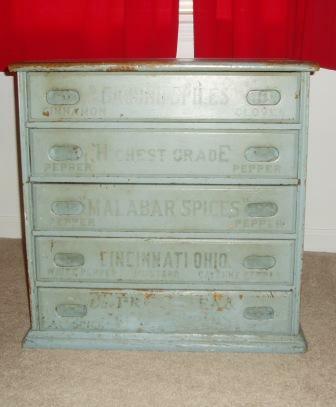 Spice drawers? During its long tenure in my grandmother’s house, it was simply the blue drawers in the hallway; for adults, the holder of telephone books, for kids, the source of puzzles and books, pencils and paper. I brought it home after my grandmother’s funeral last week, stuffing it into my tiny car along with a few photographs and a handful of handwritten recipes from the bottom kitchen drawer. I asked for this piece long ago (my grandmother had been assigning artifacts to children and grandchildren alike for nearly three decades), choosing it over the fancier formal china cabinet that resided in the den and didn’t match my personality or decorating style any more than pineapple-topped bedposts. Seriously, what’s with the pineapple-topped bedposts? It’s in my office now, slightly cleaner thanks to a brief encounter with Murphy’s Oil Soap, but still bearing evidence of its age. Rather than puzzles and phone books, it holds the essentials of a perpetual graduate student. Mostly, though, it just holds memories, and I’m grateful that my husband maneuvered it into my car with mere inches to spare.